Thunderbolt, Georgia – a town that's as cool as its name. Located just five miles from Savannah, this small town acts as a gateway to historic sites in the southeastern part of the state, such as the Bonaventure Cemetery. Because of its location, Thunderbolt residents deal with numerous pests both indoors and outside. Whether it's a flea infestation in the house or mosquitoes in the yard, Ideal Pest Control has an answer to annoying pests. 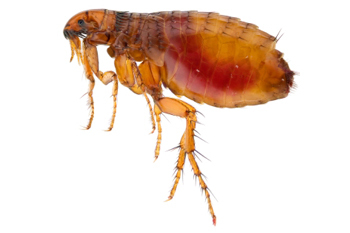 Whether they're inside or outside, a flea infestation is something to take seriously. These nuisance pests feed on blood and attack people and animals, causing allergic reactions and transmitting various diseases. Fleas breed uncontrollably and quickly infest yards and other grassy areas. They hop onto pets and come indoors where they burrow into carpets and lay their eggs. Using over-the-counter flea sprays and vacuuming your carpet only helps so much. Not every product affects the eggs or reaches them deep down in the carpet. Our professional technicians know how to treat fleas and their eggs, eliminating them successfully and preventing further infestations. One random termite doesn't cause many problems unless it's a scout eyeing your home. Termite colonies can have as many as a thousand members working together to devour wood, to raise the young and to expand the nest. As the nest grows, it reaches farther into the structure, weakening it until the wood sags, buckles or collapses. Over time, termite colonies cost homeowners in the U.S. a billion dollars in damages. It's important to take immediate action if you suspect a termite infestation. Our professionals know how to identify termite entryways, to treat a termite colony and to apply preventative treatments to stop reinfestations. Mosquitoes spread diseases wherever they travel, such as the West Nile and Zika viruses. One bite is all it takes for an infected mosquito to transmit a virus to humans or to cause heartworms in family pets. These blood-thirsty insects normally hunt during the early morning and evening hours. However, they will often hunt in the heat of the day, especially in Thunderbolt's humid climate during the summer. Only the females bite and feed on blood since they need protein to produce their eggs. The males use nectar and honeydew as their food sources. If you have standing water in your yard, you're giving female mosquitoes a place in which to lay their eggs. Our certified technicians can help remove mosquito breeding spots, eliminate infestations and set up barriers around your home to keep them out. Contact Ideal Pest Control to get your free estimate. Our technicians will inspect your home and property for termites, mosquitoes, and other invasive pests and eliminate them with effective treatments. We can also set up customized treatment programs to help keep your home free of annoying pests throughout the year.